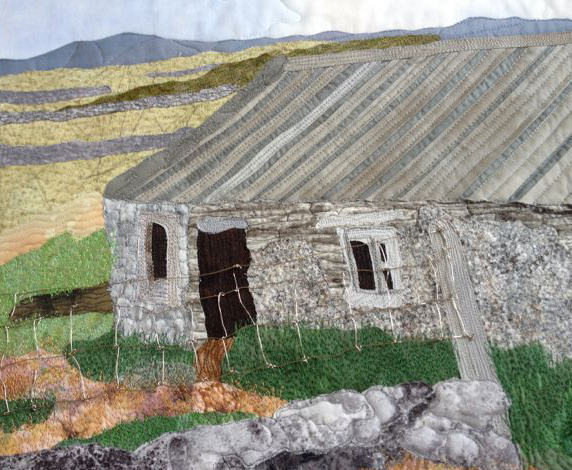 The Irish Cottage is well on its way to completion. The last bit involved a little bit of jewelry wire! 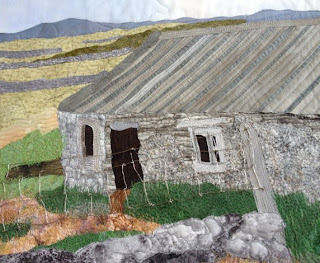 The actual cottage that the quilt depicts had an old wire fence running along the road. While I could have simply stitched one in, someone suggested actually using wire to construct it. I played with some alternatives and eventually decided that the wire used in making earrings might work best. It is easily available at bead stores and fairly simple to shape. At first I was concerned that it might prove a distraction to the rest of the scene, but since it sits against a fairly detailed background, it tends to blend in. In the end, I am quite pleased with the effect. The real wire adds a delightful third dimension, Judy. Neat idea! I also like the addition of the wire. I have played with the use of wire in one of my pieces as well.